You are here: Home / Recipes / Easy Cake Mix Cookies – 3 Ingredients! 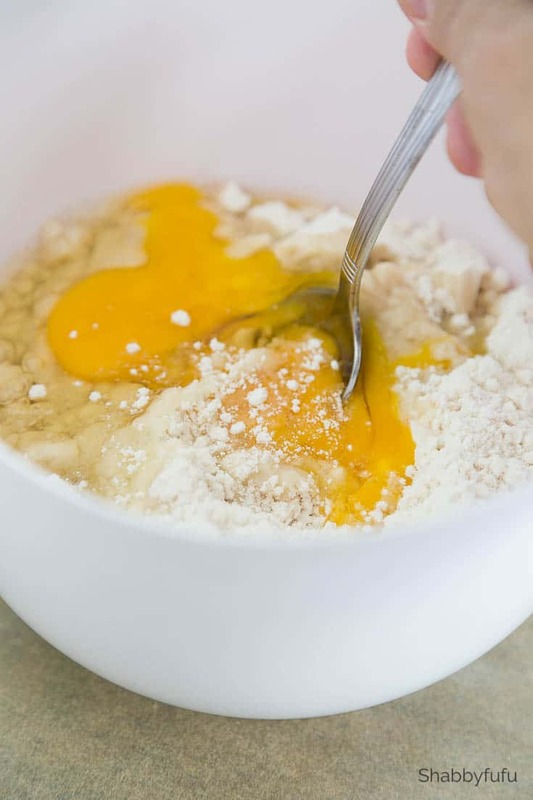 Easy Cake Mix Cookies – 3 Ingredients! Easy cake mix cookies are delicious and simple to make with just 3 ingredients! I recently made these for my daughter’s wedding reception (see that post HERE) and they were so delicious! This cookie recipe is easy to make and the cookies are so soft and chewy and you can customize them with any flavors that you like. 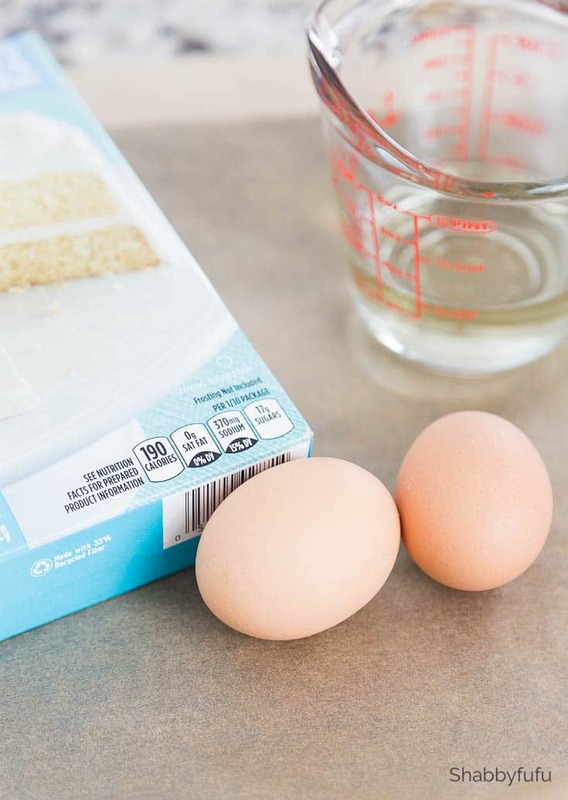 You just need a box of any of your favorite cake mix, eggs and vegetable oil and that is it friends! I thought that these would not only be light for an outdoor wedding reception dessert, but pretty to look at. I often take my dessert inspiration from Betty Crocker, and purchase her cake mixes as well. To be honest, it’s the easiest cookie recipe that you’ll ever make and cake mix cookies can be make in any variety. You don’t need to do any fancy cutting or decorating, simply mix and refrigerate and then roll into balls and bake. Boom…done, decorate, eat! If you are on Pinterest…PIN THIS RECIPE FOR LATER! 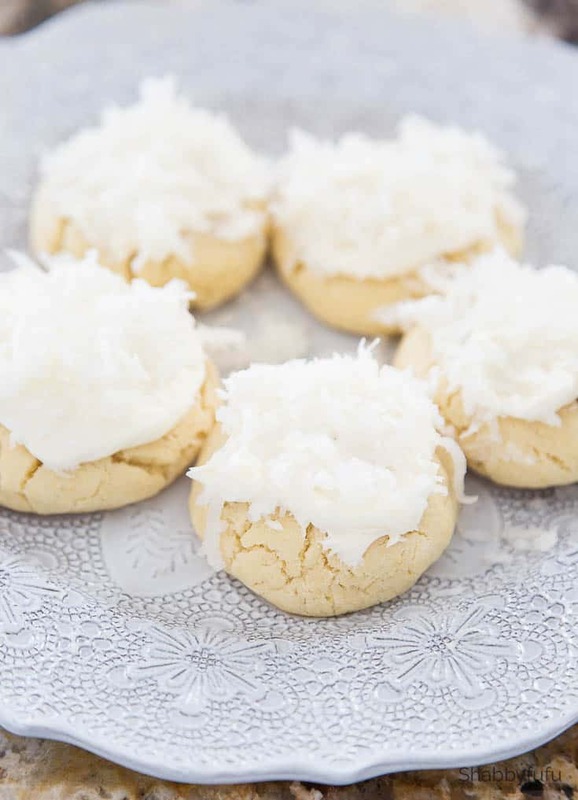 Easy cake mix cookies are simple to make for a wedding or any event. They soft and delicious! They only need 3 ingredients and essentially you can make them color themed for fun. 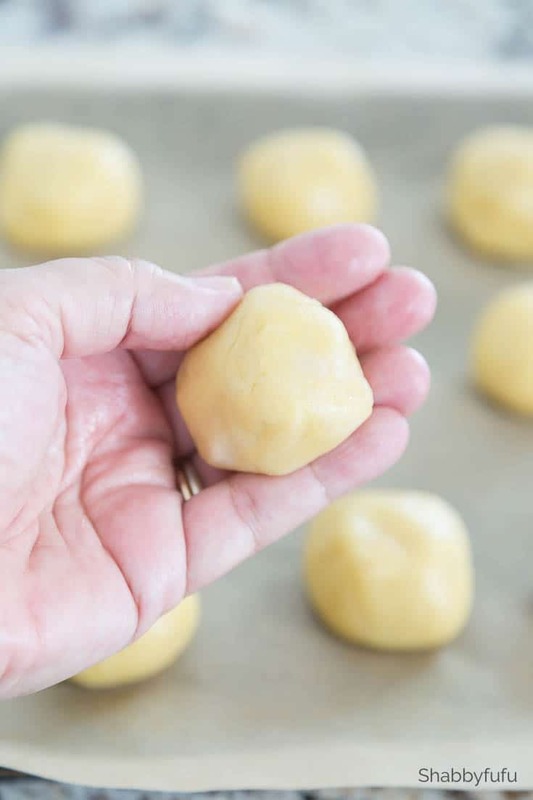 Refrigerate dough for 15 to 20 minutes to make it handle without sticking. 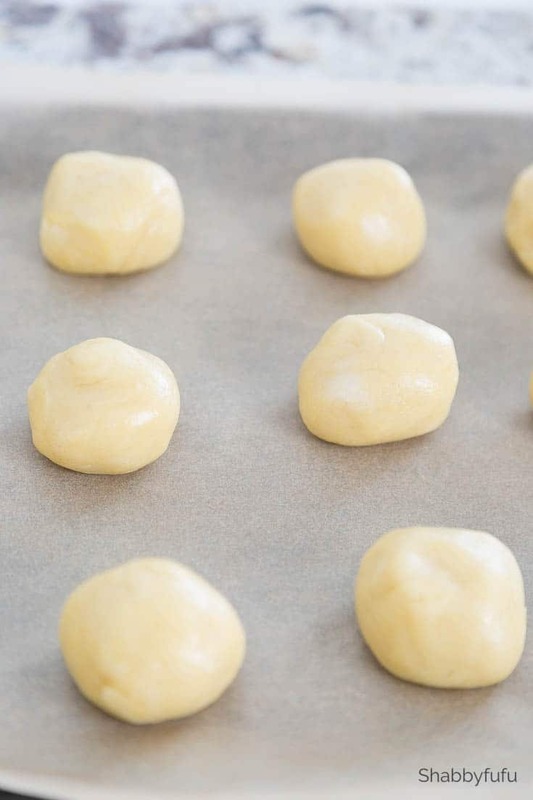 Shape dough into 1" balls and place on ungreased cookie sheet about 2" apart. Bake for around 12 minutes or until set and edges start to brown. Move to a wire rack after slightly cooled and frost when completely cooled. 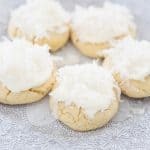 I used canned vanilla frosting and shredded coconut on top for white wedding cookies, but you can customize as you like. Try using chocolate cake mix and chocolate chips or any of your favorite flavors! Thankyou, that’s inspired! Busy people everywhere will be happy! Thank you Janet for sharing such a quick and fun way to make a dessert for any occasion. I enjoy all your ideas and have been a fan of yours for years. Congrats on your daughter’s marriage and very sorry to hear about the loss of your Mom. They look fabulous! The recipe is missing one of the ingredients: eggs. Do we add two? I’m going to try these for a dinner gathering this weekend. Not sure how that happened but it’s been updated. Thanks Jane and yes, you add two eggs! They were super simple and looked more complicated! Have a wonderful day Babette! Really easy and delicious, Love that icing. Perfect treat for the wedding! I wasn’t about to do much cooking or baking with all of my other “mom tasks”, but these were the easiest cookies! Easy easy. Love it. Just curious, what did you decorate with for a frosting? I’m thinking of using the lemon cake mix with a lemony frosting. I used a vanilla frosting straight from the can Cindy, but lemon would be amazing too for this simple recipe! I’d love to know how it goes for you. I know what you mean Cindy! Our daughter and her husband left last night and guess who will be eating any/all of the leftovers…lol! Can’t wait to try these! Easy baking recipes is how I roll for sure! Great idea for a larger group. Congratulations on the wedding! These are a “must try” Holiday….simple is how I roll in the baking dept too! I’m a little confused by the size of the cake mix box. Most of what I see in my stores are 15.25 oz. boxes, but I think your recipe says a 1 lb. box? Will this recipe work ok with the smaller box size? I find it frustrating how much smaller the boxes of cake mix have become. They make much smaller cakes that look skimpy in the pans. Thanks! Thanks for stopping by Colleen! I know…they are shrinking in size and cost more, but it will work with the same ratios for any size cake mix around 1 lb.